Toronto Maple Leafs winger Andreas Johnsson began his first full National Hockey League campaign with zero goals and just one assist in his first 10 games. 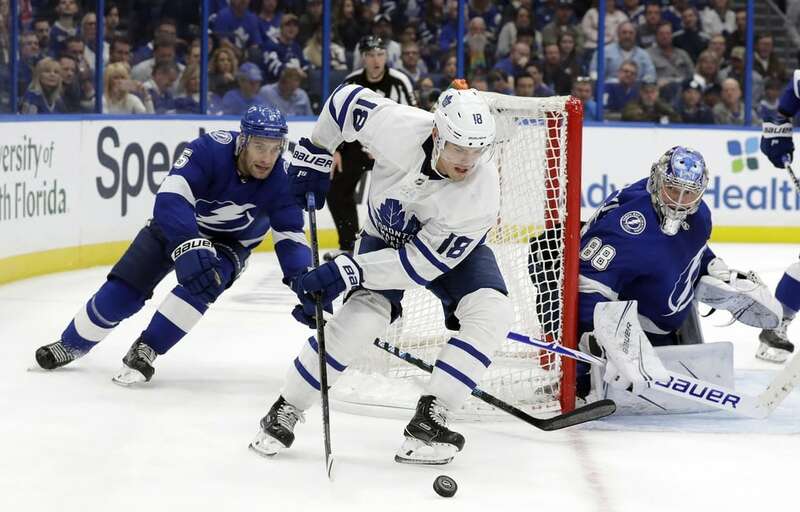 Last season’s American Hockey League playoffs MVP didn’t score his first NHL goal of 2018-19 until Nov. 9. He scored again two games later, but even that only brought his season total to three points in his first 18 games. Saturday, Nov. 24, 2018, however, was a turning point for the 24-year-old. While many Philadelphia Flyers fans remember it as the last straw for general manager Ron Hextall, Leafs Nation remembers it because Johnsson recorded a hat trick in a 6-0 win. 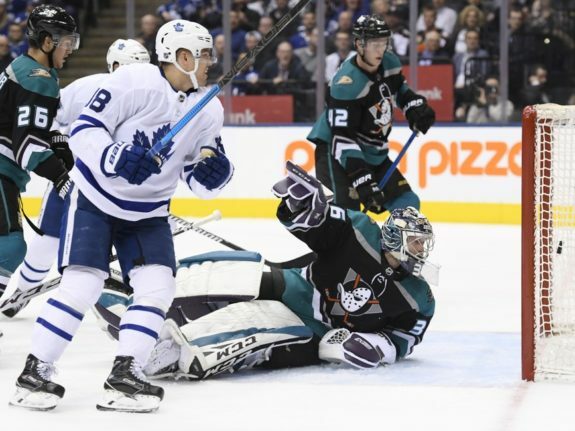 Ever since that blowout, the Swede seems to be a different player, which is great news for the Maple Leafs, and bad news for the rest of the NHL. In his last four games, Johnsson has four goals and three assists, while averaging the 16th-most ice time per-game on the Maple Leafs. Six of those seven points have come at even strength. But his production really can be traced back to that Nov. 24 game against the Flyers, which is a stretch of 31 games. In that span, Johnsson has 22 points at five-on-five, tied for the 15th-most in the NHL. That’s more five-on-five points than Auston Matthews (21), more than Morgan Rielly (21), more than Nazem Kadri (13) and more than twice as many as William Nylander (10). As noteworthy as that is in and of itself, Johnsson has also done it while averaging significantly less ice time than almost all of the other NHL leaders. Because he has averaged just 12:01 on the ice per-game at five-on-fie, Johnsson is first in the league (minimum of 300 minutes played) since Nov. 24 in five-on-five points per-60 minutes (P/60), with 3.54. In that same time frame, he is third in the NHL in goals per-60 minutes (G/60), with 1.77. Even if you include his incredibly slow start, Johnsson’s 2.63 P/60 on the season as a whole still ranks 28th league-wide. Here’s where he ranks compared to his teammates, keeping in mind that he began the season with just three points in his first 18 games. His 2.63 P/60 puts him ahead of guys like Nathan MacKinnon, Evgeni Malkin and Sean Monahan. While Kevin Papetti jokes above about Johnsson having nobody to play with, it’s important to note that he’s only referring to the recent combination of Johnsson with Frederik Gauthier and Par Lindholm on the fourth line. If you look at Johnsson’s most common centre since Nov. 24, it’s clear that quality of teammates has not been an issue (and may actually help explain his strong output before February). As you can see, since Nov. 24, Johnsson has spent over 70 per cent of his ice time with either Matthews or Tavares. That probably explains a lot of his production. In his last 31 games, Johnsson is shooting a ridiculous 26.19 per cent at five-on-five, the third-highest in the NHL. While we can partially credit his centres for that high conversion rate, you also need to credit Johnsson for finding open space in dangerous areas, like he did this past weekend against the Montreal Canadiens. In that clip, timing is everything. Johnsson starts from just inside the top of the circle and slowly starts to move towards the slot. He pounces on his opportunity only when Zach Hyman has started his wrap-around because that distracts Shea Weber, who’s defending in front. Weber tries to block the pass, but I’m not sure he realizes Johnsson is right behind him with his stick on the ice until it’s too late. Johnsson getting to the slot like he did above seems to be a pattern this season. 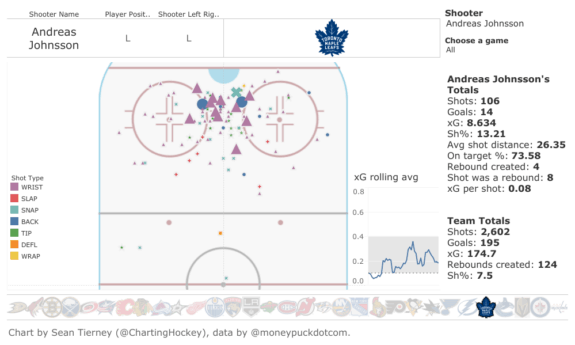 Thanks to Sean Tierney and MoneyPuck.com, we can take a look at where each of Johnsson’s 14 goals this season have come from. Thirteen of his 14 goals have come right from the slot, mostly the low slot, while his 14th came from the high slot. Eleven of the 14 have been off wrist shots. With an average shot distance of 26.35 ft. — the closest of all Maple Leafs forwards except for Patrick Marleau, Tavares and Hyman — and roughly five more goals than his expected goal total of 8.634, it’s clear Johnsson has a knack for getting open and then quickly converting on shots from right in front. He also rarely misses the net, as his 73.58 on target percentage is the third-best of Leaf forwards. On Monday, Ben Ennis and J.D. Bunkis had The Athletic’s Justin Bourne on the Good Show on the Fan 590 to ask whether he thinks Johnsson is underused by head coach Mike Babcock, based on his spot on the fourth line and his production. Bourne, who spent time as a video coach with the Toronto Marlies, said he thinks Babcock doesn’t want to tinker with something that is working so well. While I can see both sides of the argument, I have to side with Bunkis here. It just doesn’t make sense to have such a skilled and productive player lined up alongside Gauthier and Lindholm. 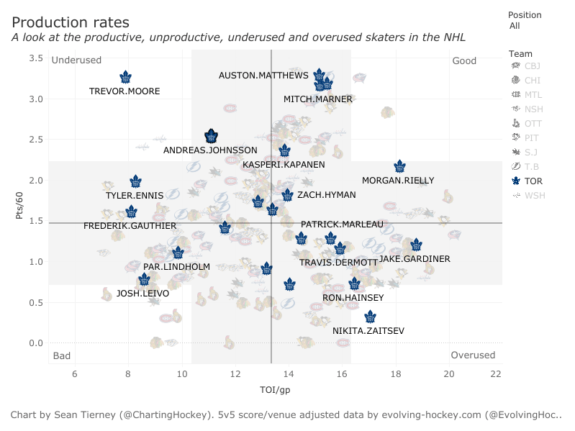 I’m sure when the line’s production slows down — which it has to given the law of averages — Babcock will switch things up. But right now, that fourth line makes me sick. I truly feel bad for Johnsson. If somehow he can keep this up, he may even surpass 50 points this season. With 29 right now, he’d need 21 more points in the 27 remaining Maple Leafs games on the schedule. That’s a tall task, but given his current confidence level, I wouldn’t bet against him.